For more than 100 million years since the time of dinosaurs, marine turtles have covered vast distances across the world’s ocean, performing a vital and integral role in marine and coastal ecosystems. However, over the last 200 years, human activities have threatened the survival of these ancient mariners. According the scientists, there are now only seven existing species of marine turtles in the world. All of them are listed on Appendix I of the Convention on International Trade in Endangered Species of Wild Fauna and Flora (CITES). Three of these species are classified as critically endangered by IUCN and a further three are classified as endangered. In fact, marine turtles appear to have the potential to reproduce abundantly: females can lay hundreds of eggs in one nesting season. Nevertheless, even under "natural" conditions, relatively few young turtles could survive their first year of life. Indeed, following some researches, among 1,000 newborn turtles, there is only one individual could survive to adulthood. As a matter of fact, after hatching, as their way from the nest to the sea, marine turtles often face to many dangers from their natural predators such as crabs, foxes, and birds and even when they reach the shallows, many more small turtles are taken by fish. 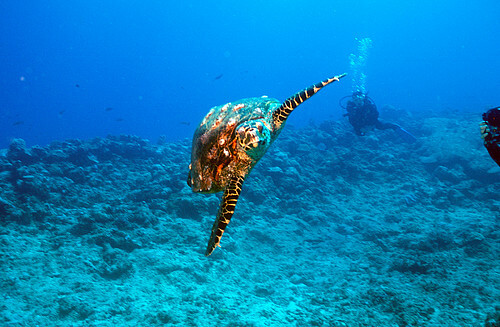 Marine turtles are considered as one of the priority species protecting by WWF. Over the years, WWF has implemented many initiatives and programs of conservation and recovery the marine turtles' populations worldwide. In Vietnam, WWF-Vietnam has launched many projects with the goals to protect habitats and number of marine turtles’ populations, raise public awareness, and increase the capacity of authorities. To reach these goals, since 2003, WWF-Vietnam has closely collaborated with some National Parks and Nature Reserves in Vietnam including Con Dao National Park, Nui Chua National Park, and Phu Quoc Marine Reserve. Currently, WWF-Vietnam has continued projects to minimize the risk of incidental capture through the introduction of new fishing methods. These five species are listed in the Vietnam’s Red Data Book. All of them have feeding areas in Vietnam's sea but unlike these other four species, loggerhead sea turtle does not have breeding season in Vietnam.